Winners of the 2014 All Ireland Scholarships were officially recognised by the Republic of Ireland Soccer Manager, Martin O’Neill and the Minister for Education & Skills, Jan O’Sullivan TD, at an awards ceremony today Saturday 8th November, 2014 at the University of Limerick. Jan O’Sullivan TD and the Minister for Employment and Learning, Northern Ireland, Dr Stephen Farry presented 126 highly talented students from the North and South with a third-level scholarship award. Sponsored by JP McManus, the educational scheme is set to provide financial assistance to many high achieving students who completed their Leaving Certificate/A Level examinations in 2014. JP McManus, presented Lee Pollock from Newtownards, Co Down with a surprise commemorative gift to recognise the fact that he is the 1000th winner of a JP McManus third-level scholarship. Combining the two educational bursaries, CBS Sexton Street, Limerick and the All Ireland Scholarships, there are now a total of 1,014 scholars throughout the 32 counties. 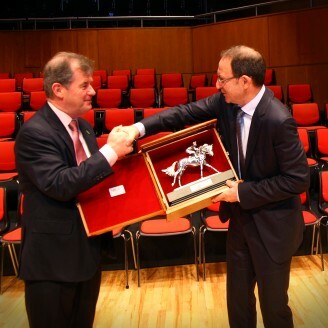 Commenting at the awards ceremony, JP McManus said; “I would like to commend the award recipients. Each of you has worked hard and you deserve nothing more than to continue your studies and excel in your chosen field and I wish you every success in the future. 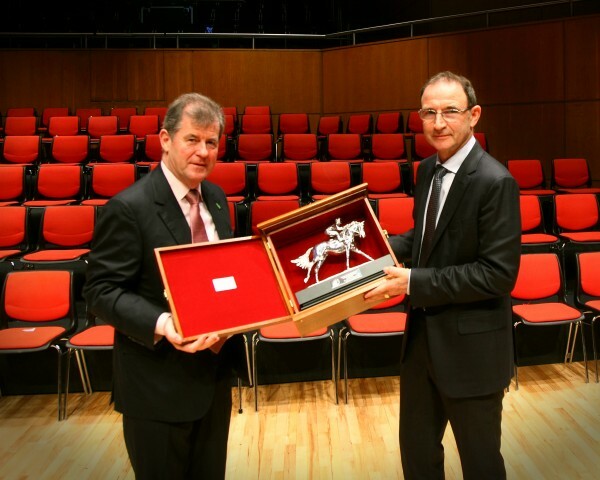 He added; “It is a privilege to welcome our special guest today, Martin O’Neill. His contribution, both as a player and as a manager to the “beautiful game” has been unique. We are very grateful that he has joined us today as he is an inspiration to all people Irish both north and south and I wish him every success in his role as Manager of the Irish team”. The scholarships have been set at €6,750 per annum in Ireland and stg£5,500 in Northern Ireland and will continue for the duration of the undergraduate programme chosen by the scholarship winners. 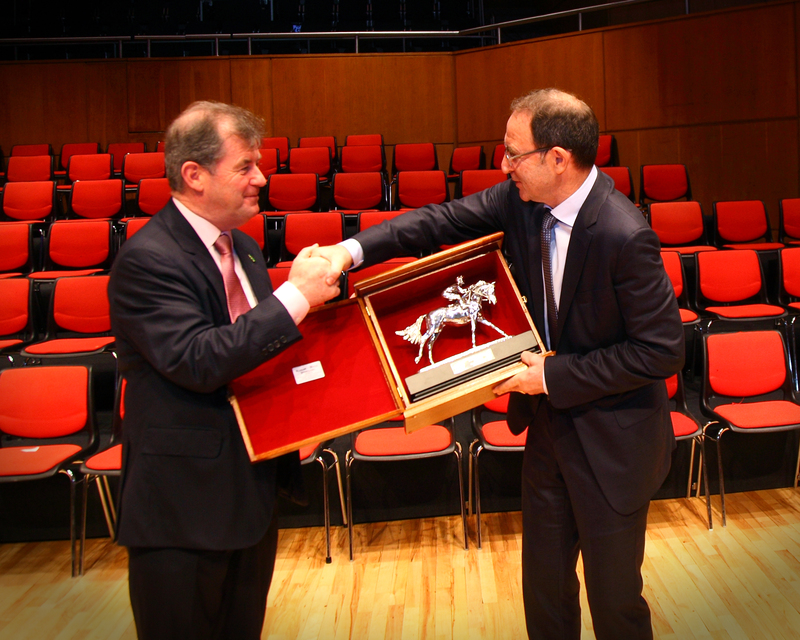 JP McManus has contributed a total of €32 million in support of third-level educational initiatives in recognition of the 32 counties of Ireland. The All Ireland Scholarship Trust has received €30 million to fund the provision of these bursaries each year and it is estimated that over 1,300 students throughout the country will benefit from the scheme over its duration. The remaining €2 million has been contributed to the Paddy Harrington Golf Scholarships at NUI Maynooth. The scholarships scheme is administered by the Department of Education & Skills, the Department for Employment & Learning with support from the Department of Education, Northern Ireland.